DOOM, the latest entry of the classic FPS series created by id Software, has finally been released a few days ago in all regions and on all formats, but this doesn’t mean that the team is done with the game. We already know that Vulkan support will be coming soon to the PC version of the game, and recently id Software’s Tiago Sousa has revealed more on what may be coming in the future. 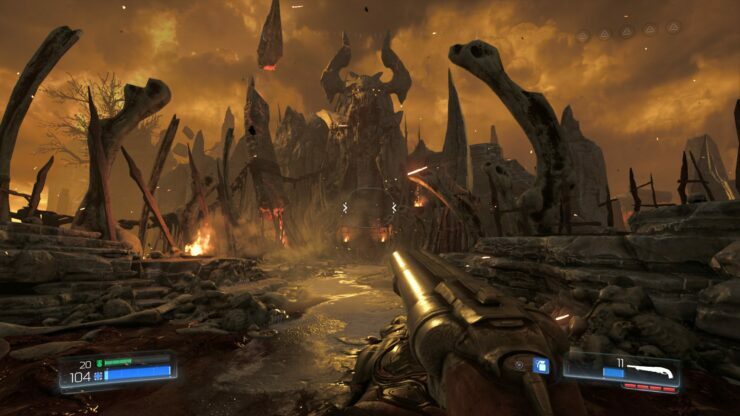 A DOOM fas recently asked id Software’s Lead Renderer Programmer about the inclusion of other Render Modes outside the currently available Default, Gritty and Cinematic. Tiago Sousa answered that more might be coming in the future, noting that the currently available ones have been implemented as the team felt they were modes that players might have wanted to play DOOM in. DOOM’s performance is quite solid on powerful machines, but those playing the game on laptops and less powerful PCs have had to tweak the settings to keep a steady and smooth framerate. A DOOM player has recently asked Tiago Sousa about the possible implementation of dynamic resolution scaling, but it seems like it won’t be coming anytime soon. A few days ago, it’s been confirmed that the PC version of DOOM is going to get official SLI support in the future. Several users have noted that the game already runs great with SLI, but Tiago Sousa confirmed that there’s an issue with shadows limiting SLI scaling. DOOM is now available in all regions on PC, PlayStation 4 and Xbox One. We will keep you updated on the game’s future patches as soon as more comes in on them, so stay tuned for all the latest news.